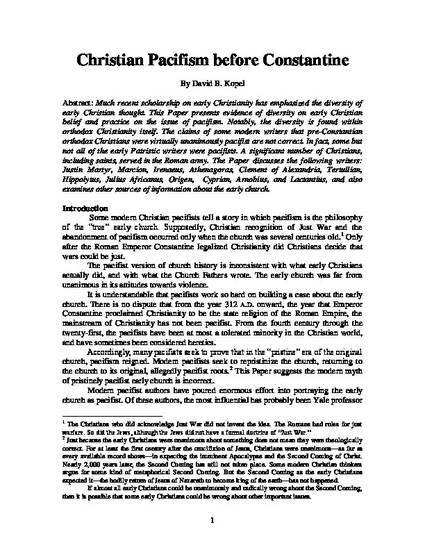 Much recent scholarship on early Christianity has emphasized the diversity of early Christian thought. This Paper presents evidence of diversity on early Christian belief and practice on the issue of pacifism. Notably, the diversity is found within orthodox Christianity itself. The claims of some modern writers that pre-Constantian orthodox Christians were virtually unanimously pacifist are not correct. In fact, some but not all of the early Patristic writers were pacifists. A significant number of Christians, including saints, served in the Roman army. The Paper discusses the following writers: Justin Martyr, Marcion, Irenaeus, Athenagoras, Clement of Alexandria, Tertullian, Hippolytus, Julius Africanus, Origen, Cyprian, Arnobius, and Lactantius, and also examines other sources of information about the early church.